Income Tax Department Recruitment 2016 -2017- Candidates looking for Government Jobs Recruitment have a good news as Income Tax Department has released notification for the recruitment of Inspector, Tax Assistant, Stenographer, MTS Posts Posts for the year 2016. Eligible and interested candidates may apply online on or before 12th May, 2016.. For further details like age limit, educational qualification, selection process, how to apply, age limit can read the full notification. For any questions in mind feel free to ask below in comments. 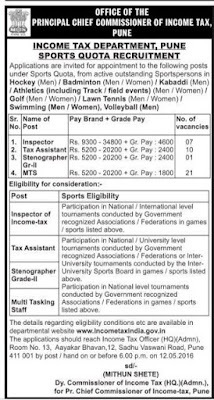 Income Tax Department introduce Inspector, Tax Assistant, Stenographer, MTS posts in March 2016. Recruitment of all these posts on regular based. Candidates should send their print out of completed application forms to given address. As per notification total number of posts is 39. The official notification has been uploaded. All details regarding these posts is below, we are requesting to all candidates please read full information carefully. Please download official notification from below link. Any query and problem just comment in box below, we will contact you immediately. Read full information for Income Tax Department recruitment 2016. Educational Eligibility : For Educational Qualification details of Inspector, Tax Assistant, Stenographer, MTS candidates should visit official notification to get complete details. Age limit : Should visit official notification to get complete details. There is no Application fee (non-refundable) for candidates belongs to all categories. Selection Process : Engagement of Charge man posts would be depended on written exam followed by Trade Test only. Written exam is an objective type. How To Apply: Candidates should send hard copy of application forms in prescribed format only. Candidates have to fill the form with true based information. Last Date of online apply is 12/05/2016. A) Download application form in prescribed format from official website link given below. B) Check post details and all information regarding post and fill with carefully. C) Send applications to given address on or before due date of 12th May, 2016. D) Address is "Income Tax Officer (HQ) (Admin), Room No.13, Aayakar Bhavan, 12, Sadhu Vaswani Road, Pune 411 001". Envelope containing the form must be mentioned as "Application for the Post of _____". No TA/DA admissible to attend the written exam/test. Closing date for receiving application forms is 30th May, 2016. So this was all about the Income Tax Department Recruitment 2016 -2017. Hope you would have got all the details looking for. 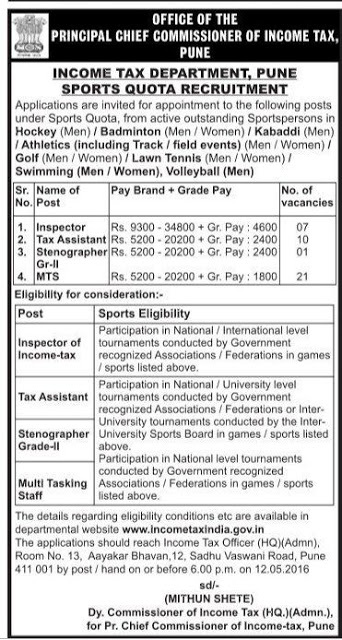 Candidates can apply for the post from the above details and can read the official notification for further details. For any questions regrading Income Tax Department Recruitment 2016 -2017 feel free to ask below in comments.